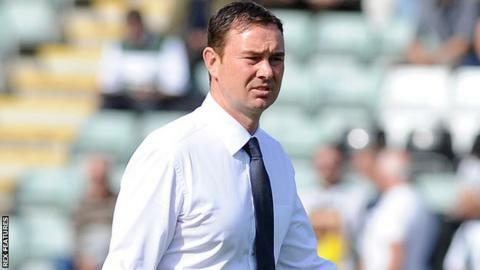 Plymouth Argyle were not able to cope with the "professional" nature of Carlisle as they lost in the FA Cup, according to manager Derek Adams. The Pilgrims, who lead League Two by five points, lost 2-0 to their division rivals and failed to trouble the Cumbrians throughout the match. "They were professional, they did a good job on us," Adams told BBC Devon. "They took their time, got players behind the ball and were professional in the way they won." The defeat was only the second Plymouth have suffered in the last 12 games as Adams, who led Ross County to the 2010 Scottish Cup final, experienced the FA Cup for the first time as a manager. "They stopped us playing, they committed fouls," said Adams. "They didn't trouble Luke McCormick in the game - I don't think he had a save to make - but their goalkeeper hasn't had a save to make either. "We didn't perform to the standard that we know we can do, but that's something you're going to get from time to time and you have to deal with it. "We've had an excellent spell at the start of the season, but we need to pick ourselves up and go again. "We've got to realise that we're going to come up against teams like Carlisle that are going to be stubborn and stop play and be professional and that's what they've done."